A major aspect of grooming your dogs is keeping their nails at an appropriate length. There are a number of things that can go wrong if you let your dog’s nails grow too long. First, your dog won’t be able to walk or run properly. Imagine trying to walk around with your toes curled under your feet. When the dogs can’t walk properly, it puts a lot of unnecessary strain on their muscles and their spine. If the nails grow too long, they can become ingrown, and those ingrown nails are prone to infection and cause your dog a lot of pain. It’s very important that you start trimming your dog’s nails when they’re a young puppy. If you get them comfortable with having their nails trimmed early on, it will make everything much easier moving forward. To get your puppy comfortable with having its nails trimmed, you should first get them comfortable with the sight and sound of the clipper. Give them some peanut butter, and clip the clippers near their paws without actually trimming their nails. After some time doing this, they’ll be happy to see the clipper. Make sure you take things slow, because you don’t want to make your puppy afraid of the clippers. When clipping your dog’s nails, it’s very important that you don’t clip the quick. The quick is the part of the nail that is colored differently and closer to them. On some nails, the quick will appear pink and the actual nail will appear white, while on others, it may appear black on black. If you clip the quick, it will not only cause tremendous pain to the dog, but the cut will also bleed for hours. Avoid clipping the quick by making multiple small clips and making your way up before you go too far. Dog’s nails should be trimmed whenever they get too long, no matter how old they are. To tell if your dog’s nails are too long, you can see if you hear their claws click against the floor when they walk. If their claws are clicking against tile or concrete floors, they need to be trimmed. You can also tell by holding up their paw and looking to see if the nail comes down beyond the pad of the paw. 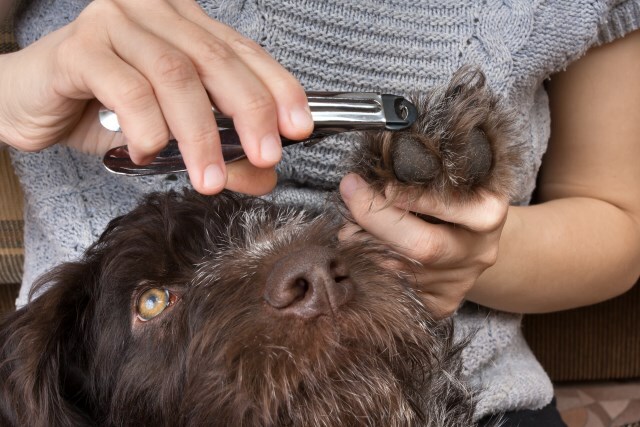 You can choose to use nail clippers or nail files to shorten your dog’s nails, depending on which you feel more comfortable using. The clippers are quicker, while you’re less likely to have an accidental cut with a file.